Faster Sales pitches won't lead to faster sales. 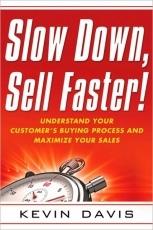 The key to speeding up the sales process is to actually slow down and get in sync with your customer's buying process. Customers don't care about your selling process. They're moving through their own buying process, a set of predictable steps that doesn't match how most salespeople sell. With the highly effective techniques in Slow Down, Sell Faster!, you'll learn how to help your customers through each step of their buying process faster, and with the odds shifted in your favor. You already know how to sell. It's time to learn how people buy - - to slow down so you can sell faster!